Joshua Larsen, of Pierson, has something to be proud of—he has grown the heaviest pumpkin in Michigan for 2018. He took it to the official weigh off in Ohio last weekend, where it came in at a whopping 1901.5 pounds. Josh and his wife, Michelle, own Sticks and Stones in Pierson. It was there that Josh grew his pumpkin. According to Michelle, he started off with two, but one of them died at the end of August. “All pumpkins are weighed at an official weigh off location. 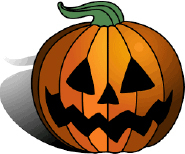 Pumpkins must be in excellent condition (no cracks or other damage) or they will be disqualified. 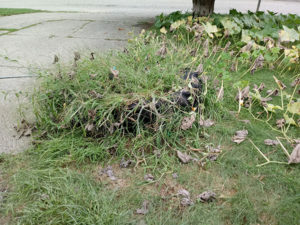 To make it grow so big it takes a lot of water, time and good fertilizers,” she explained. The pumpkin he grew last year weighed 1886 pounds, and ranked as the fifth all time biggest in Michigan. This year’s gave him another spot, so now he has the fifth and sixth place spots. The record in Michigan is 2,043.5, grown last year by Mark Clementz, of Holly, Mich. The record in the U.S. is 2,528 pounds; the world record is 2,624 pounds. That’s a lot of pumpkin pies! 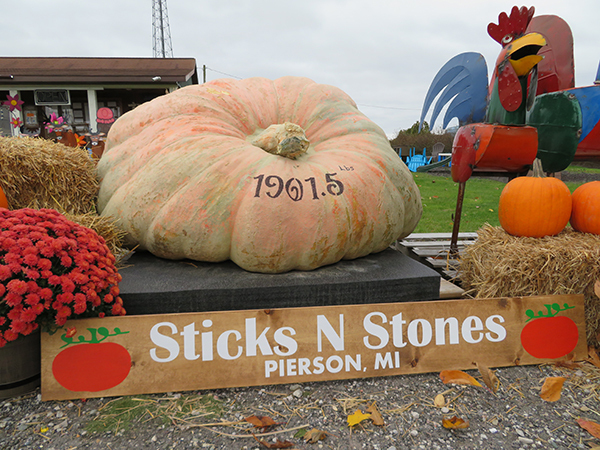 The pumpkin will be on display at Sticks and Stones until October 28, which is the last day of the season for them. They are located at 21723 W Cannonsville Rd, Pierson. Google “pumpkin” and you will find everything from riots in (Keene) New Hampshire to Ichabod Crane’s unfortunate encounter with the headless horseman, to pumpkin scones. We have pumpkin festivals, pumpkin carving contests, smashing pumpkins, pumpkin tossing, pumpkin baking and biggest pumpkin contests. A true Native American, the pumpkin has been embraced by our cultures as both an important food source for people and livestock, and an excellent medium for carving. Something about these colorful canvasses really stirs the creative juices in artists of all ages! Throw in a candle and you have a lovely Jack-o-lantern. With its growing season complete from early to mid October, is it any wonder that this vibrantly colored fruit has become synonymous with Halloween? Yet pumpkins have a relatively short history with the holiday known as Halloween, which is believed to have evolved from the ancient festival of Samhain. It has its origins in European culture. Samhain was the Celtic harvest festival, a time to stock up supplies for the winter. The ancient Gaels believed the final day in October to be a time when the two worlds (the living and the dead) overlapped allowing the dead to return to Earth and cause havoc among the living. Offerings from the harvest were left outside their doors to appease the spirits in an effort to prevent them from bringing sickness and blight to the crops. Door to door begging, or “souling,” (a precursor to our modern day trick-or-treat) came much later and was associated with All Souls Day. Our native pumpkin entered into the holiday when Irish immigrants brought the tradition of the Jack-o-lantern—originally a carved turnip or gourd—to the U.S. during the 1700s. Turnips had their drawbacks; they were relatively small and dense, with no pre-formed cavity in which to place a lit coal. With its broad base and large capacity, the pumpkin quickly became the preferred medium for the practice. Today, a large percentage of fresh bought pumpkins lends itself to this Halloween tradition, decorating our porches and giving young artists a chance to stretch their creative wings. Once used as a welcoming light for the spirits of our loved ones and to ward off any malevolent spirits, the Jack-o-Lantern has become a Halloween fantasy, a joyful pastime and a profitable market for farmers of the crop. Unfortunately, few of us these days consume pumpkin that does not come out of a can. Unfortunate, because pumpkin, one of the winter squashes, is an excellent source of dietary nutrition. Pumpkins are rich in beta-carotene, an important antioxidant, which the body uses to convert to vitamin A. Foods rich in beta-carotene have been linked to lower risk of certain cancers and offer protection against heart disease as well as an aid in the degenerative aspects of aging. Pumpkin is high in potassium and dietary fiber as well, necessary nutrients for the heart and digestive tract respectively. A cup of cooked pumpkin contains about 49 calories, a dieter’s dream! 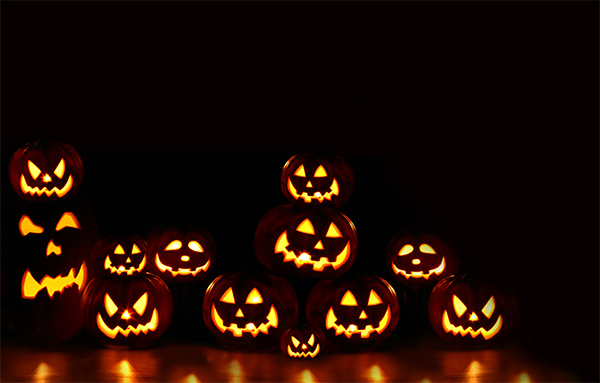 So, as you carve your pumpkins this year, consider using the cut outs (minus the rind) in soups, stews or rice dishes. Or try some pumpkin chili. Any way you slice it, it comes out deliciously nutritious. In a large skillet, brown beef. Drain most of the oils and remove beef to a Dutch oven. In saucepan in remaining oil, cook and stir onion, garlic, carrots and pumpkin for about two minutes, until onion is tender. Drain the rest of the oil and add to the beef. Add remaining ingredients except for the chili powder. Cook and stir until boiling. Reduce heat and add chili powder to taste. This will gain some heat as it cooks, so start lightly. Cook over med to low heat about 30 minutes or until pumpkin is tender and flavors have mixed. Add additional chili powder about 15 minutes into the cooking process if you wish. Serve with grated cheese, crushed corn chips (I like Frito’s™ Chili Cheese) and sour cream if desired. Other additions include chopped fresh onions or chopped bell peppers. This is even better the next day. Nothing says Fall quite so well as the pumpkin! Its bold color and robust texture are characteristic of the season. It is a fall favorite in the U.S., selling over 1 billion pounds annually in its relatively short season. Over 90 percent of our nation’s processed pumpkin comes from the State of Illinois, with a majority (85 percent) being processed for sale with the Libby’s ® label. Most Americans today have never made a pumpkin pie that has not come out of a can. Pumpkins, as other squashes, are native to America and Native Americans grew and harvested them for centuries. It was one of a group of crops known as the “three sisters” and was grown in conjunction with corn and beans. 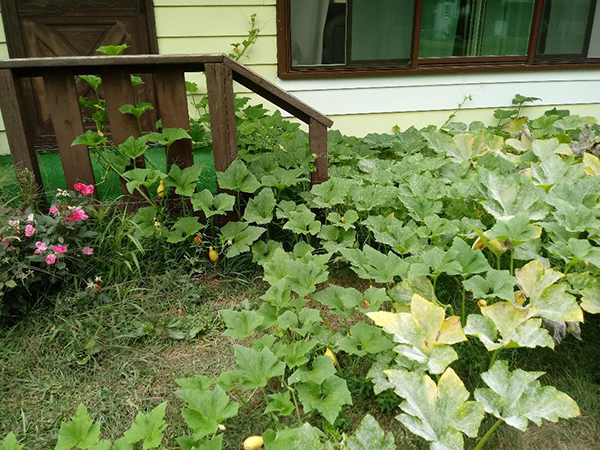 The corn stalk provided a pole for the beans to grow, while the pumpkin covered the ground, providing cover to deter weeds and to keep the soil moist. The Iroquois legend of the three sisters speaks of a Sky woman who fell to Earth, becoming the first woman on Earth. Being with child, she gave birth to a daughter who in turn, gave birth to twins by the West Wind. The woman died in childbirth and the children buried her; from the ground where she lay, sprouted corn, beans and pumpkins, which served as the main food staples of the Iroquois. While pumpkins are most popular here as a carving base these days, the fruit is loaded with nutritional value. Pumpkins are high in vitamin A and beta carotene; the seeds are high in protein and rich in a highly nutritious, flavorful oil. The flowers and the leaves are edible and considered a delicacy in some countries. Some little known facts: pumpkins are used as a feed for livestock; the raw fruit can be used as a supplement to chickens during the winter to aid in egg production; the biggest pumpkin on record weighed in at a whopping 2009 pounds; Columbus brought the first pumpkins back to Europe from the New World; the largest pumpkin pie ever made was over five feet in diameter and weighed over 350 pounds; canned pumpkin (not pie filling) has been recommended by veterinarians as a supplement for dogs and cats experiencing ailments such as constipation, diarrhea or hairballs. Still not convinced that you should buy a pumpkin? Consider pumpkin chucking. A competitive sport in which teams build devices to throw a pumpkin as far as possible. Pecans to scatter on top as desired. Mix pumpkin, evaporated milk, eggs, pumpkin pie mix, salt and sugar in bowl. Pour in 13”x9” cake pan. Cover with 1 box of Yellow Cake mix. Scatter pecans on top. Melt butter and drizzle over the top. Bake at 400 for about 40 minutes. Note: Solon Market will be closed October 5 for Red Flannel Festival. We will be open again the following week. Proud grandparents Steve and Renee Fisk, of Trufant, brought in this cute photo they took of their granddaughter, Rillie Ann Fisk, 10 months old, of Coral. She appears to have popped right out of this pumpkin, just in time for Halloween!